This time I walked to the L’Union Estate – a park with a big enclosure with giant tortoises and very old cemetery. The La Digue Cemetery was the private burial place for the Mellon family who was among the first settlers on La Digue during the early 1800’s. Mrs. Louise Mellon (née Desjardins) was the first owner of L’Union. 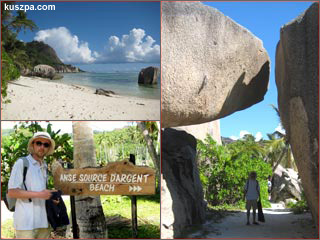 Her sons, friends and relatives are buried here and her descendants still live on La Digue. Through the park you can also reach some lovely beaches like Anse Pierrot, Anse aux Cédres, Anse Bonnet Carré and the famous Anse Source d’Argent.